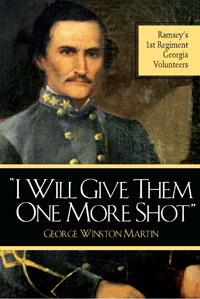 Beginning with the tumultuous events leading to Georgia’s secession from the Union, “I Will Give Them One More Shot” follows the 1st Georgia Volunteer Infantry Regiment, commanded by Colonel James N. Ramsey, as it travels from its formation at Macon, Georgia, to Pensacola, Richmond, Western (now West) Virginia and the Shenandoah Valley. Ramsey’s regiment meets with initial success in a minor skirmish in the Allegheny Mountains at Laurel Hill, but then is involved in a disastrous retreat and rear guard fights at Kalers Ford and Corricks Ford, during which six companies are cut off from the army and become lost in the rugged Alleghenies, starving to the point of contemplating cannibalism. Serving under General Robert E. Lee at Cheat Mountain, the regiment finds itself involved in a friendly fire incident, then later fights well in the Confederate victory at Greenbriar River. Subsequently sent to the Shenandoah Valley to serve under General Thomas J. “Stonewall” Jackson, the 1st endures horrible conditions in the winter ice and snow as the regiment marches to Bath, Hancock, and Romney. Left in fetid and isolated winter quarters in Romney, the army to which the Georgians belong comes near to mutiny. The last two chapters review what happened to the soldiers and officers of the 1st after they mustered out in March 1862, concluding with the fate of prominent characters and sites. Appendices list the commands under which the 1st Georgia served during major events in its year of service, casualties in the unit, and a roster of the 1,331 men who served with the regiment.